Summer has officially ended. I can’t kid myself anymore and this past week it was as if someone had turned on a tap. A very big Heavenly tap and the rains came down. Heavy, loud rain, pelting our roof that it woke us a few times during the nights but the type of weather that makes you incredibly grateful to be tucked up warm and cosy and dry in a safe place. 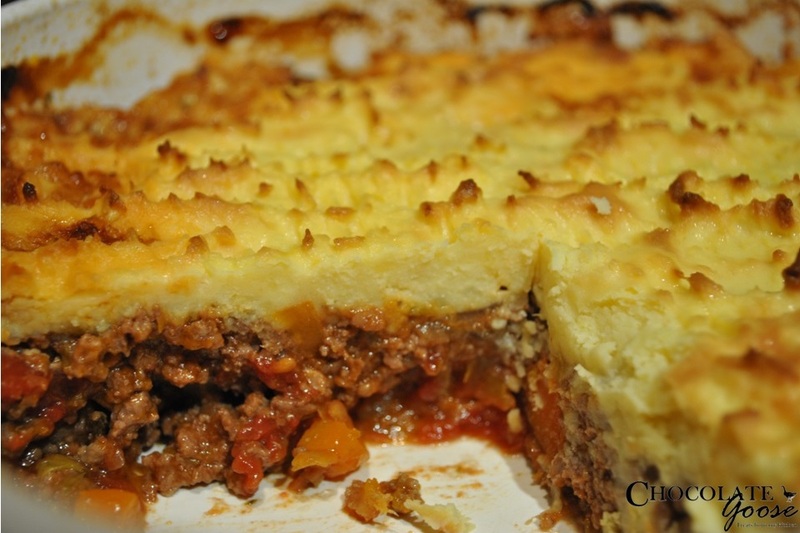 Unsurprisingly, this cooler, wetter weather has me thinking about hearty comfort foods, one of them being my hubby’s favourite Cottage Pie. I’ve always used the terms Cottage and Shepherd’s Pie interchangeably, but strictly speaking, Cottage Pie denotes a beef pie, while Shepherd’s Pie means it is made using lamb or mutton – logical really, seeing as though shepherd’s look after sheep. I’ve tried different versions of this recipe, simpler ones, but I always return to this one. Although a little more work is involved, it is definitely worth it. You first prepare a basic beef mixture containing onion, garlic, tinned tomato (or fresh if you have the time to peel and prepare the tomatoes) and a little tomato paste. As this mixture is fairly plain and the basis for many different meals, it’s a good idea to prepare in bulk and either used straight away if you’re making a few meals, or it can be frozen to be used later. While this is simmering, get the potatoes peeled and into boiling water until they are soft enough to mash. A few secret ingredients are added to the mashed potato but I’m getting ahead of myself. In a separate pan, leeks, carrots and mushrooms are fried until soft. You can add other veggies, but as I said, after trying many alternatives, I always return to this version – why change something that just works the way it is? This dish also freezes well so if you can, make a double batch and either freeze half or just the left overs. I then defrost it in the fridge overnight and either zap individual portions in the microwave to reheat or bring a larger dish back up to temperature in the oven. It must be completely defrosted though before you place it in the oven or you risk poisoning your loved ones, and none of us wants that. Sauté the onion and garlic in a little oil. Add the mince and fry until it changes colour. Season well with the salt and pepper. Mix the tinned tomato with the tomato paste and add to the mince. Reduce the heat and simmer for about 10 minutes. Boil the potatoes in salted water until tender. Drain and mash until smooth. Add the sour cream, cheese and eggs and mix. The mixture should be light and fluffy. Preheat the oven to 200°C and grease an oven-proof dish. Sauté the leeks, carrots and mushrooms in a little oil. Add the stock and deglaze the pan. Add the basic mince mixture, Worcester sauce and parsley. Taste and season if necessary. Spoon the mince mixture into the oven dish and top with the mashed potato. Rough up the top of the potato with a fork as if it is too smooth, it creates a hard shell which isn’t great. The roughed up peeks brown nicely in the oven adding a little character. Bake for 25 – 30 minutes. Serve with a salad or more veggies on the side.